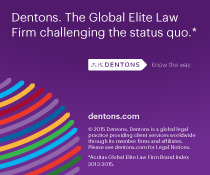 Dentons’ Tax practice has been ranked Band 1 in Tax in Russia by Chambers Europe 2019, once again joining the leaders in this annual international ranking. The version of the Russian Federation Administrative Offenses Code in effect since early 2017 says that there are administrative sanctions for not submitting the statistics form tracking the movement of goods to a customs authority, or for late submission. Partner and head of Russian Tax and Customs practice Dentons Dzhangar Dzhalchinov has become an exclusive winner of the 2019 Client Choice Corporate Tax award for Russia for the second time. January 2019 was marked by an upsurge in court activity in considering issues related to Russian companies’ filing of notices of participation in foreign entities and notices of controlled foreign companies (СFСs). Four cases considered by the Moscow Commercial Court caught our attention at once: the Moskabelmet, INFRASTRUKTURA TK, Almera and Inspektorat R cases.